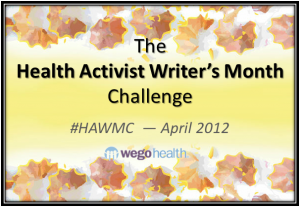 Sometimes It Is Lupus: Health Writer's Month: What Can't I Live Without? Ten things I couldn't live without. Can I start by saying that living so much of my life on-line, and therefore internationally, has given me a great deal of perspective on what I thought was essential! A good doctor and pharmacist. The Australian Pharmaceutical Benefits Scheme. I am blessed to live somewhere that people on a low income can still afford needed medication. I'm horrified when I hear of people who can't afford the medication they need, either for survival or to control symptoms of lupus or whatever other awful health conditions. The fresh food that is still cheap and plentiful here. Something of value to do. A couple of years of not working has taught me how much I need to feel like I've done something worthwhile. My odds and ends of work in part-time ministry, and my blogging, give me a sense that I am contributing something of value to the world around me. I love how you have God at #1. So many people have lost faith in the world today and it's comforting to see fellow believers. I have to find the strength to get up in the morning somewhere - I don't usually have any of my own! I wish I could travel and meet all the people I only know on-line. Maybe one day I will be well enough.